Content: There’s some science terms and such in this, but they’re explained pretty well. It’s a bit on a higher grade level, but I think 5th graders and up could handle it. It’s in the kids’ biography section at the bookstore. I’m a sucker for biographies highlighting people or things I don’t know much about. And this one definitely fits the bill. Conkling highlights two physicists doing research in the 1920s and 1930s, ones that I didn’t know anything about. Irene Curie was the daughter of the more-famous Marie, but was a stellar physicist in her own right. Along with her husband, Frederic Joliot, she discovered artificial radiation. This opened up many avenues in the scientific world. And while she got credit, no one (well, not us non-scientists anyway) remember her for this. The other scientist Conkling highlights — and in some ways, the more interesting story — is Leisl Meitner. She, along with several other scientists, discovered nuclear fission. The rub, though, is that because Leisl was considered a Jew in Nazi Germany (her grandparents were Jewish), she had to flee to Sweden. Then her partner (and friend?! ), Otto Hahn, completely wrote her out of the research. He said he did this all on his own, mostly because he was afraid of the Nazis. It’s a fascinating story, and Conkling does a good job of explaining the science (there’s some helpful tables, etc. throughout the book) as well as making both of these fascinating women come to life. 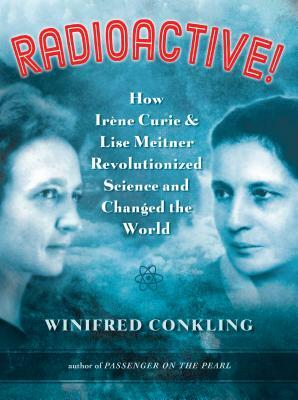 There’s a bit about their history, their relationship with the scientific community (which was incredibly sexist, no surprise), as well as a lot on their contributions to the advancement of physics. It’s fascinating and well worth the read.